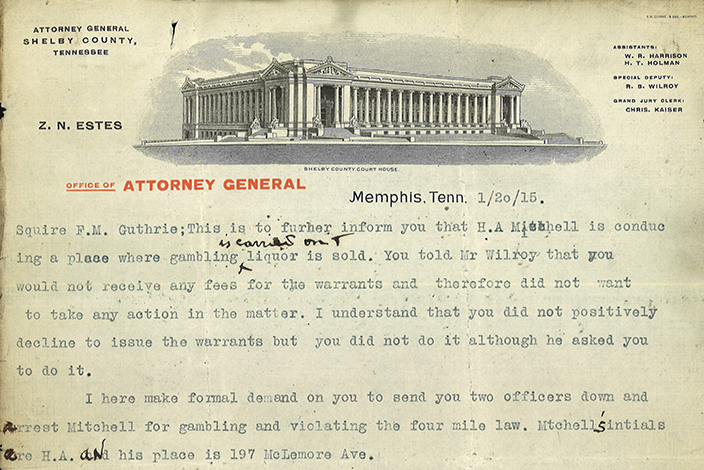 The Tennessee State Library & Archives recently launched a new online ordering system for Supreme Court cases. The new system will allow researchers to request cases dating back to the early 1800s in hard copy or digital scans. It also allows searching the cases for names of ancestors as well as topics ranging from mining to murder. The online system was designed to create an easier and more direct way for researchers from around the world to order these fascinating historical records, formerly available only by visiting Nashville. Once stored in the attic of the Tennessee State Capitol building, the Supreme Court records came to the Library & Archives in dire need of restoration. Curled and brittle, covered in coal dust from the furnace pipes that fed into the Capitol’s storage space, the records were all but unusable. The Library & Archives' archival technical staff has worked tirelessly toward the preservation of these records for more than a decade. Staff members have meticulously cleaned off the dust and grime, carefully flattened, and recorded the contents for more than 50,000 cases. The archivists will continue this project indefinitely, as there are well over 10,000 boxes of material in storage. "It is one of our goals in the Department of State to improve public access to important government records," Secretary of State Tre Hargett said. "Making it possible for people to order records online is one way we are able to accomplish that goal. I want to thank members of the Library & Archives staff who have worked tirelessly to restore those Supreme Court records and make them available online." Supreme Court records provide a wealth of information of benefit to professional and amateur historians. The stories that unfold in the pages of each case are windows to personal and community life and family relationships from the past. One can find cases concerning land issues, debt, slavery, estate disputes, criminal cases and much more. Cases currently housed at the Library & Archives range from the beginning of the 19th Century to around 1950. They vary in size, from brief records to complete transcripts of all proceedings, which can be hundreds of pages long. Some of these cases include exhibits, such as textiles, photographs and maps.